Well, we’re starting a new year, time to put away the things of the past and move on into the future. SO my big question to you is, has your wardrobe moved along with you? 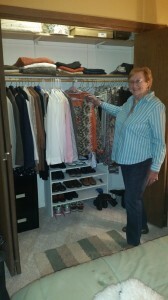 Does your closet suit your current lifestyle and activities? When was the last time you updated your jeans? Are you still buying clothes a generation younger than your age? I spent about 2 hours this weekend just going through my own closet to unearth the “unwearables” and I challenged myself to start letting go. It felt more like an archeological dig, I found many things I’d hung onto for an old friend by the name of: Justine Case. – There was a stained white shirt I kept for Justine – just in case – I needed a shirt to paint the garage. -The jeans that have been a size too small for the last 5 yrs Justine Case I lost 10 lbs. -Then there’s the square-toed cowboy boots I got 2 decades ago Justine Case I got invited to a hoe down. 1. What am I moving away from in my wardrobe? 2. And what am I moving toward? Then go through your closet and pull out: three things you love and wear a lot, and three things you didn’t put on at all this past year. Take some time to think about the image you want to present in 2015. Look at the three you wore and enjoyed and let them be your guideline for the future. For added inspiration, do a style search on-line, check out Pinterest, or go through catalogs and magazines to further sharpen your vision. Then take the three things that no longer suit you and give them to a friend, or someone who might be blessed by them – Who knows – these new pieces might become the three things that they love. So stop saving clothes for Justine Case and get crackin’ on that closet! 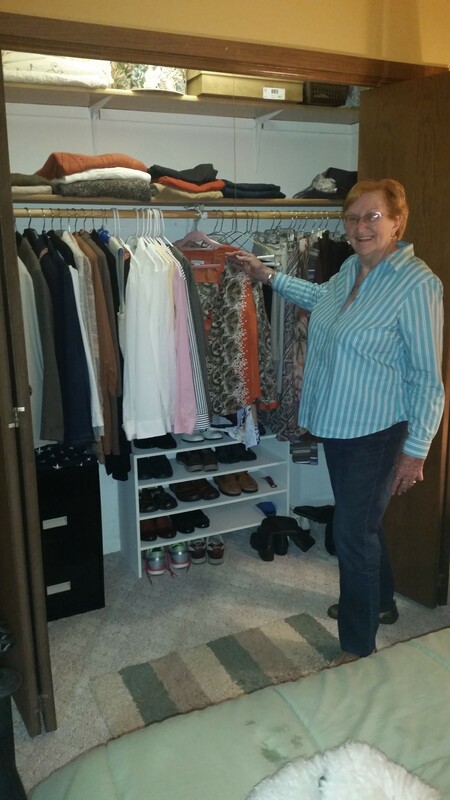 Here’s a picture of a dear client who is 90 years young and her closet I had the privilege to work in recently – proving that wardrobe therapy is an ongoing process for all of us! Thanks Jill! I,too, get overwhelmed with the idea of a whole closet overhaul. Love the idea of starting with three pieces!